Ok so I got to clean them just a bit so I could take a picture. I really love how the mica swirl turned out on top! The swirls on the inside are nice as well, I just wish I hadn't gotten partial gel =( The colors pretty much stayed true, but the black could have been darker. Overall I'm very pleased how it turned out. Here is a close up view of the top when it was still wet. Oh my heavens! How impeccable! Your swirls are just fabulous! 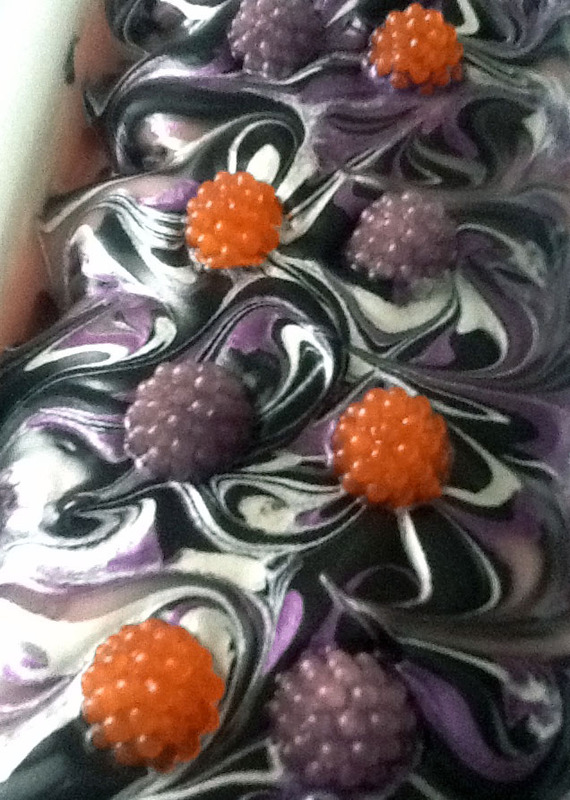 The swirls are amazing and the small raspberries are very cute :) Like the contrast between orange and dark purple. I really love how you did this. The extra detail of the berries on top is exquisite! This soap is so pretty! And I have major soap mold envy! I've been wanting a berries mold for ages lol. Great job! Thanks!! I put in one of my blog posts below where I got those... if you are still interested in finding one. Lovely!!! I love the colors selection and the swirls. Absolutely beautiful! Thank you! I stepped a bit out of my comfort zone and will probably step back in for a bit lol. Stunning! What a lovely soap! wow, this is just stunning! love the colour and your swirls. very pretty and I like berries on top! That is a serious work of art!! I can't blame you for being so anxious to cut it! Beautiful inside and out! Stunning! Love the color combos and the swirls. The berries are a lovely added touch.